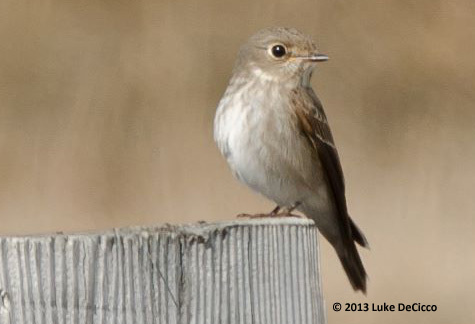 Mainland Alaska just got its first Dark-sided Flycatcher (and I believe mainland North America too, but correct me if I’m wrong). Thede Tobish, Nick Hajdukovich, Lisa Oakley, and Luke DeCicco found this Code 4 species at Barrow, Alaska on June 17. The bird was found near the DEW line site northeast of town (map here). There are signs that this is a restricted area, but DeCicco reports that a person on site said it was OK to bird this area, though they were cautioned to be careful about contanimants. At this time, it’s unclear if others should check in before birding this area or if blanket permission was obtained. To get to this site, drive northeast on Stevenson St. (the road that parallels the Chukchi Sea shoreline) to Dewline Rd. Turn right and continue to its end. 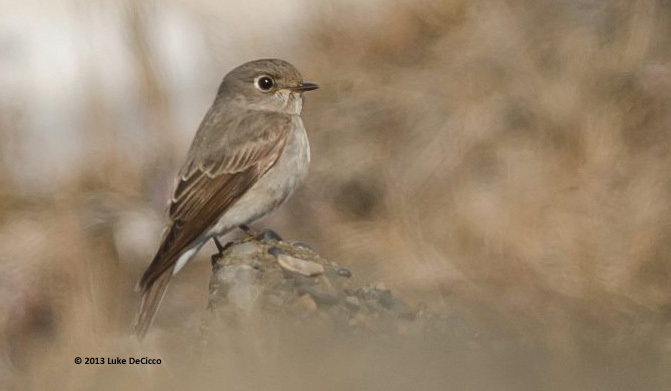 The Dark-sided Flycatcher was found at the west end of the two long buildings. Previous ABA Area records have come from Alaska’s islands in the Bering Sea region. There is also a record from Bermuda.